The 2012 IZOD INDYCAR Series has started with Team Penske taking every thing of value so far on their open wheel tour. 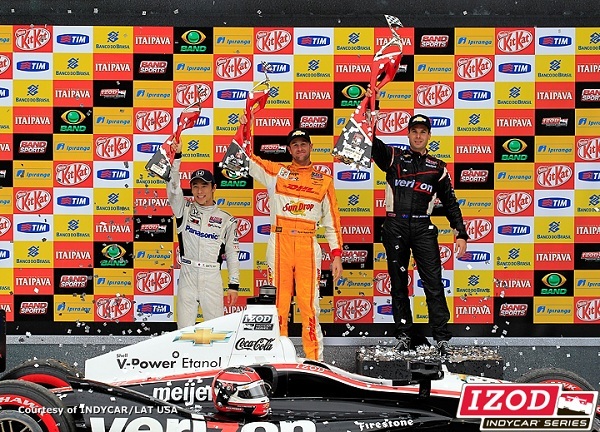 Team Penske drivers Helio Castroneves and Will Power have collectively won the first three rounds in the 2012 season. Winning the first three United States race in the IZOD INDYCAR Series, the Itaipava Sao Paulo Indy 300 presented by Nestle provided a change of scenery where other members of the 26-car open wheel racing field were intent on claiming glory. In qualifying, the Chevrolet-powered #12 Team Penske car of Will Power fended off the challenge of Dario Franchitti's #10 Target Chip Ganassi Dallara DW12 race car. A member of the Honda engine brigade that received the aid of a more powerful turbocharger unit for this weekend's event, this would be a break-out race for the reigning IZOD INDYCAR Series champion who had been haunted by a difficult start to 2012 where him and his Target Chip Ganassi Racing team appeared off-form from previous seasons. Despite the newly-invigorated competition from the Honda runners, the pole-sitter at the start of the 75-lap Itaipava Sao Paulo Indy 300 jetted away. For anyone expecting that the IZOD INDYCAR Series' pattern of Team Penske dominance in 2012 would be defeated in Brazil, Will Power gave no indication of that happening. The #12 car of Power led the first 51 laps on the streets of Sao Paulo and was handily faster than Dario Franchitti early on and the Ryan Hunter-Reay's #28 car for Andretti Autosport. Seeking to join the #12 car of Will Power, Team Penske Ryan Briscoe surged through the field in a hurry early in the Itaipava Sao Paulo Indy 300 race. Started 9th, the #2 car of Briscoe diced into 6th place by lap 19 and climbed to 4th two laps later. Driving a fast Dallara-Chevrolet, Ryan Briscoe's advance ended with the #2 car in the turn 10 wall on lap 22. This finish was Briscoe's first DNF of the 2012 season and the first for a Team Penske machine this year. After a brief caution to remove the derelict car of Ryan Briscoe, the race restarted on lap 26. As Dario Franchitti is sent spinning by contact from the #14 car piloted by Mike Conway, the yellow flag returned. Falling to 22nd from the incident, Franchitti would recover over the course of the remaining laps to secure a top-5 run. 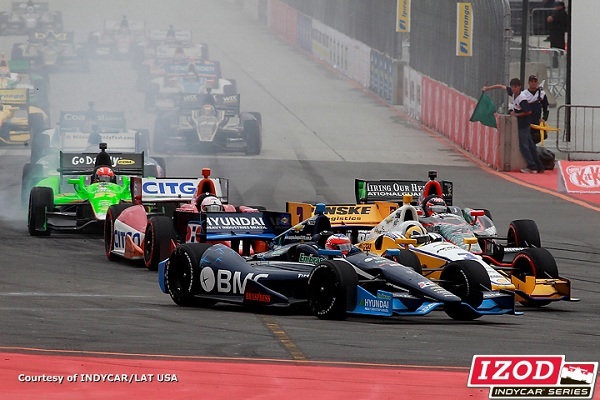 A multi-car accident in turn 2 brought out caution on lap 30 concluding a very slow period of the Sao Paulo IZOD INDYCAR race. Ultimately ending the race for Simona de Silvestro’s #78 car, other drivedia ers including the James Jakes and Josef Newgarden were hindered by the bottleneck in turn 2. In the case of Newgarden, he would proceed to set fastest lap at the Itaipava Sao Paulo Indy 300 on lap 58 with the #67 Sarah Fisher Hartman Racing entry. Into the last one-third distance of the event, a pit stop of Will Power offered what would be the only chances for other cars to lead the Itaipava Sao Paulo Indy 300. Leading on lap 53, Helio Castroneves delighted the Brazilian fans with a presence at the front of the IZOD INDYCAR field. James Hinchcliffe also recorded one lap in the lead on the 2.536-mile road course before turning the lead over to the #9 car of Scott Dixon. While the Target Chip Ganassi Racing car of Dixon circulated for 8 laps out front, caution flew for the Sarah Fisher Hartman Racing’s #67 car of Newgarden stopped in turn 6. Scott Dixon pitted for fuel costing him front-running track position which will prove more costly into the final 9 laps as Will Power reassumed the race’s lead. Setting up for a double-file restart, Power and Ryan Hunter-Reay led to field to the restart on lap 67. As teams battle into the tight first corner, Takuma Sato made a most daring pass on the third place car of Dario Franchitti. With an edge into the corner, Sato in the #15 Rahal Letterman Lanigan Racing entry took the final podium spot in the late stage of the Sao Paulo race. While the Japanese driver Takuma Sato demonstrated a perfect manoeuvre, other drivers on the lap 67 restart were not as successful. When the #14 AJ Foyt Racing car was negotiating the first and second corner of the low-speed section of the start course, a chain reaction caused the collection of several cars. Lead lap cars caught in the mayhem included the #9 of Scott Dixon, #38 of Graham Rahal, #26 of Macro Andretti and the #77 of Simon Pagenaud who would all lose lead lap as well as top-10 runs. 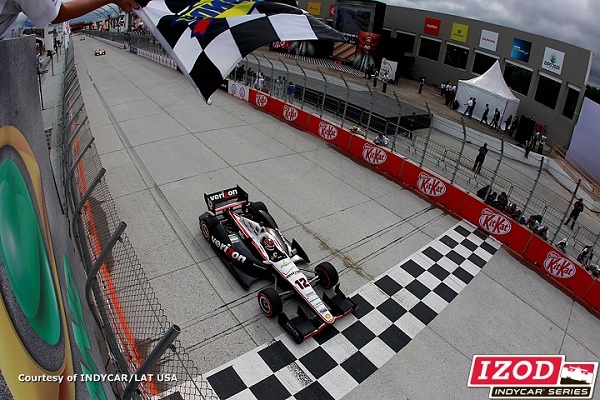 For a final 5-lap run to the checkered flag, Will Power gained a healthy lead on Hunter-Reay and won the Sao Paulo round of the IZOD INDYCAR Series for a third straight season. The #12 car owned the lead of the event for 63 of the 75 laps making for a strong effort for the Australian. Power’s win hands Team Penske a fourth-straight victory through the start of the 2012 season. “Very happy to get that third win here and third in a row. We need to make it four in a row at the most important race next.” said the winner Will Power in post race who leads the IZOD INDYCAR overall points entering the Indianapolis Motor Speedway round last month. Little over 0.9 seconds behind Power‘s #12 car, Ryan Hunter-Reay’s runner-up finish delivered the first one-two finish for Chevrolet engines. Takuma Sato would finish on the podium at the Itaipava Sao Paulo Indy 300, the former Japanese Formula 1 driver’s first highest-finish in three seasons of the IZOD INDYCAR Series. Sato’s effort with the #15 car was even more impressive based on the fact he started 25th and was assessed a pit road speeding penalty early in the race. The lone Brazilian round on the 2012 IZOD INDYCAR Series tour, the Itaipava Sao Paulo Indy 300 presented by Nestle was the only chance for four drivers to display their talent in front of a home country nation. Helio Castroneves carried his country’s pride to 4th place from a 18th starting spot. Rubens Barrichello, competing in his home city for the first time in IZOD INDYCAR racing, netted a 10th place result for KV Racing Technology. From 6th to 8th place in the Sao Paulo race, the IZOD INDYCAR Series rookies from last year have defused the sophomore jinx. Andretti Autosport’s James Hinchcliffe finished highest of the 2011 rookie group in 6th place ahead of JR Hildebrand driving for Panther Racing. Coming from 15th place to 8th over the 75 laps, Charlie Kimball was third-highest among the Honda runners in the event. The Itaipava Sao Paulo Indy 300 presented by Nestle was the final race before the Month of May celebrations and events leading up to the Indianapolis 500 of May 27th.